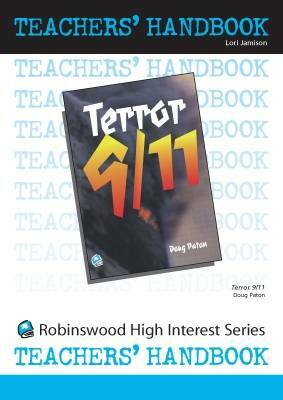 This Handbook accompanies the novel 'Terror 9/11'. It provides valuable comprehension exercises which can engage a small group or the whole class and greatly enhances understanding of the novel, its plot, characters and construction. The novels in the High Interest Teenage Series are suitable for a wide variety of students for guided reading instruction, for Literature Circle discussion and for independent reading. These are short (around 12,000 words), emotive stories that gallop through action-packed plot lines. They feature realistic characters who will keep your students engaged chapter after chapter. Dynamic writing hooks the reader quickly so even those who find regular novel-reading an absolute chore stay completely immersed in the story. Each book comes with its own corresponding Teachers' Handbook, developed and written by Lori Jamison. These are photocopiable and include activities for before and after reading, plot synopsis, character analysis and other enjoyable comprehension exercises. They help catch the wind of a student's enthusiasm and encourage pride by finishing - and appreciating - a whole book.But, the approach is on-going, matching the progress through the book, with exercises which ensure understanding in small chunks: two or three chapters at a time. "Why", Lori asks, "should a reader struggle to finish a whole novel, and then have to complete possibly boring comprehension exercises that are concerned with the novel in its entirety?"